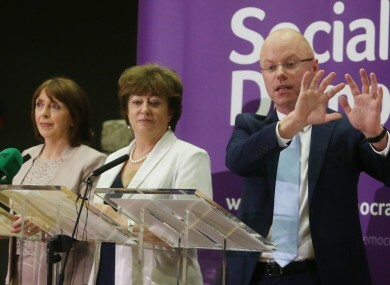 The SocDems' three leaders, Róisín Shortall, Catherine Murphy and Stephen Donnelly. THE SOCIAL DEMOCRATS have proposed to invest €1.5 billion in public services as well as abolish water charges, cut local property tax and reduce USC. The party’s three leaders, Stephen Donnelly, Róisín Shortall and Catherine Murphy, have launched their pre-budget submission this morning ahead of tomorrow’s main Budget 2016 announcement in the Dáil. Proposals include the abolition of water charges, which the SocDems claim would cost only €13 million, and to halt the installation of water meters. Donnelly explained that abolishing charges would cost €136 million. But he said that by scrapping the water conservation grant, the administration of it and not having the “significant cost of billing people” – which he estimated at €44 million – there would be an overall cost of €13 million. What we’re saying is the cost of charging people for water more or less covers the cost of charging them for water. However, Donnelly said these assumptions are “very, very conservative” and said it would “arguably save money” to abolish charges. The Wicklow TD said that Fianna Fáil and Sinn Féin’s estimations of the cost of scrapping charges had not factored in the savings made from not billing people. We’re very open to a conversation with the Irish people that says: ‘Look you’re currently paying for it through central taxation, it could be paid for through a charge in the future.’ But what we will absolutely not to do is charge people twice. Murphy said that charging was something “hypothetical, off into the future”. Elsewhere, the party wants to reduce local property tax for mortgage holders by considering the amount of stamp duty paid and the net value of the property. A tax on junk food would raise €225 million, the party claims. This would involve a higher VAT rate on foods which are high in sugar content and saturated fats. The junk food tax also includes a 20 cent levy on a packet of cigarettes, an additional 10 cent on beer, cider and spirits and a ban on below cost-selling of alcohol. There is also proposal to reduce Universal Social Charge by 0.5%. This would involve a half a per cent cut to each of the 1.5%, 3.5% and 7% rates and would be targeted at those earning under €70,000. Under this measure, somebody earning €35,000 would benefit by €175 annually while someone on €70,000 would be €525 better off. Shortall said that people’s overall cost of living would be reduced by investing in services. “It’s not just about putting an extra fiver in people’s pockets while at the same time they have to pay for all their services. What we’re talking about is investing in services so that the cost of living is reduced. The party’s childcare proposals include the introduction of a second free pre-school year, extending paid parental leave to 36 weeks (and 52 weeks by 2018), introduce two weeks of paid paternity leave, and the roll-out of a second free pre-school year from September next year. The SocDems also want to recruit 3,000 more teachers at primary and secondary level, introduce 100MB broadband in all primary schools, and restore school guidance counsellors. The party is also proposing to create 900 new positions for primary healthcare workers, allocate €75 million to fund the construction of new primary care centres and reduce the prescription charge from €2.50 to €2. Email “Could it really cost just €13 million to abolish Irish Water? ”. Feedback on “Could it really cost just €13 million to abolish Irish Water? ”.